The Post graduate department of Plant Pathology, RAU, Pusa under the university was established in the year, 1970 with intake capacity of six students in Master degree programme and two students under Ph. D. Programme. Survey & Surveillance of important diseases of major crops and important medicinal and aromatic plant – Tulsi, Satawar, Pipali, Mandukparni etc. for development of disease MAP under climatic change. Development of weather based forecasting module for important diseases of major crops. Exploration on native bio-agent and botanical products for promotion of plant health. Development of biotechnological toll for study of variability in plant pathogens and development of transgenic plants for disease resistance. Development of IDM module for important disease of major crops, medicinal & aromatic plants. 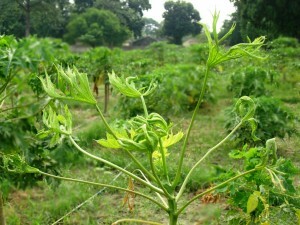 Development of IDM Module in vegetable, fruits & flowers under protected cultivation. Spray Mancozeb @2.5g/Lit or Hexacanazole @ 2 ml/Lit just after appearance of initial symptom. Apply balanced doses of NPK fertilizers. Seed treatment with Carbendazim 50 WP@2g/kg of seed. Spraying of Carbendazim @ 1 gm/Lit or Mancozeb @ 2 g/Lit at boot leaf stage and 15 days later. Adopt optimum spacing, avoid excess nitrogen. Grow moderately resistant varieties like Ajaya, IR64, Saket-4, Rajshree, Prabhat, Rajendra Bhagwati etc. Spraying of mixture of Agrimycin 100 and Blitox-50/Fytolan can significantly reduce the disease in field. 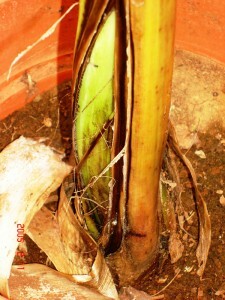 60-80 kg N/ha with required potassium may be recommended in endemic areas. Use tolerant varieties viz; Shaktiman-1,2,3 & 4, Suwan, Ganga Safed -2, Deccan, Ganga-4, Ganga-5,Kisan and Jawahar. 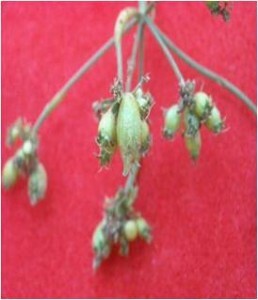 Seed treatment with Captan or Thiram @ 2.5gm/ kg seed. Spray Dithane Z-78 @ 2.5 kg/ ha in 1000-1200 liters of water, as soon as first symptoms of disease appear in the field. Treat seed with Bavistin + Thiram (1:2) or Carboxin + Thiram (1:2) @ 3.0 g/kg seed. Grow improved varieties- G-114, Awardhi, Gaurav, Udai. 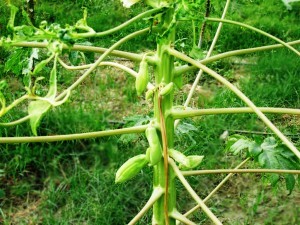 Raising of papaya seedlings under Nylon net (40-60 mesh) and spraying of Acephate 1.5g per litre, 3 days before planting+ spraying of Urea @ 10g/liter + Zinc sulphate @1.5g + Boron @ 1.0g per litre before flower initiation stage was found to significantly suppress the incidence of PRSV at the early stage of plant growth. The treatment was found to have significant effect on increasing fruit yield (50.8Kg/plant) as compared to untreated control (27.0kg/plant). 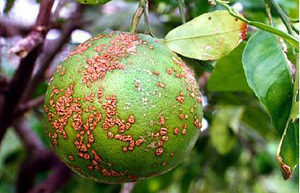 The most effective treatment for management of citrus canker was combined application of Copper oxychloride (CoC) @ 3g per litre+ Streptocycline @ 0.3 g per litre which showed least lesion/leaf i.e.8.20 lesion/leaf. This was followed by spraying of Copper oxychloride (CoC)@3g per litre showing 15.75 lesions per leaf which was statistically at par with treatment of 2% Neem seed kernel extract as spray which exhibited 18.75 lesions per leaf. 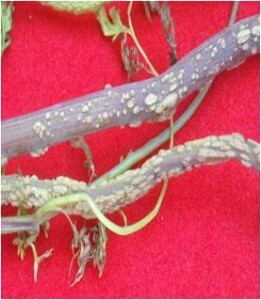 The treatment involving disease-free suckers from a disease-free field + dipping in carbendazim (0.2%) for 45 minutes followed by carbendazim drenching (0.2%) and carbendazim injection @ 3 ml of 2% solution during the 3rd, 5th and 7th month after planting (MAP) was found to be effective (wilt incidence of 6% as against 80.33% in control) in reducing wilt incidence.However, bio-control agents i.e. 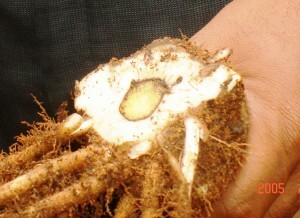 Trichoderma viride (@ 10g/sucker three times) used as soil application also found highly effective and causes marked suppression of Panama wilt so may be included in integrated crop management (ICM)/ integrated diseases management (IDM) schedule in strict organic system. 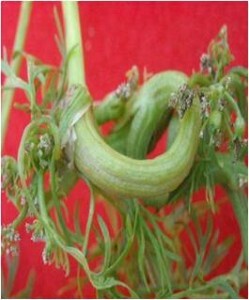 Seed treatment with Pseudomonas talc formulation @ 0.40% followed by its foliar spray @40% at 45, 60 & 75 day after sowing can be recommended to manage stem gall disease of coriander caused by Protomyces macrospours. Alternatively, seed treatment with Hexaconazole @0.20% followed by its foliar spray @0.20% at 45, 60 & 75 day after sowing can be recommended to manage stem gall disease of coriander caused by Protomyces macrosporus. 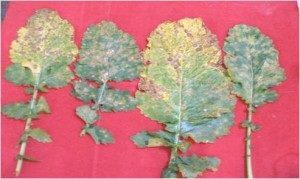 Seed treatment with Propiconazole @ 0.1% followed by its foliar spray @0.1% at flower initiation stage can be recommended to manage Alternaria blight (Alternaria brassicae) disease of mustard.